shaelynn is using Smore newsletters to spread the word online. She is a singer-songwriter that influences young boys and girls. She has made her own movie called Part Of Me. She is still performing and hopefully will be for years to come. This is a photo taking from her music video Dark Horse also one of the songs from her latest album Prism. Her real name is Katheryn Elizabeth Hudson. ( She changed her name to Katy Perry to avoid confusion with Kate Hudson.) She was born on October,25,1984. She lived in Santa Barbara, California. She has one sister named Angela Hudson and a brother named David Hudson. Katy Perry was signed by Red Hill Records in 2007. She has 8 albums including her first album Katy Hudson. She also has 93 songs in counting. She has won 55 awards. She is the first person since Michel Jackson to have 5 number 1 songs from the same album. Her parents names are Mary Perry and Keith Hudson. Growing up Katy Perry's parents were very strict. In 2009, Russell Brand proposed to Katy Perry while they were watching fireworks on an elephant in India. They got married on December,30,2010 then a year later on the same day Russell filed a divorce paper. She was also engaged to John Mayer, but the broke up before they got married. 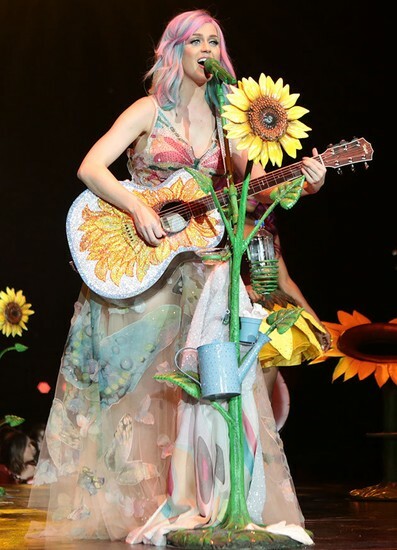 Katy Perry always tries to wow her audience with her very unique style. Katy Perry is still performing and singing/writing new songs. She is also making appearances on talk shows. Although no one knows when she will release a new album or if Prism will be her last.